Got some free webbing, a mini drybag, hikers cup and other bits going for free. 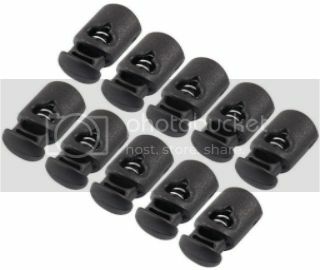 One of my sleeping bag compression sack's plastic cord lock snapped and I went on to Aliexpress to buy 3 for extra redundancy (at US 75c 'each'). Didn't realise that the 'each' by their definition was a bag of 10. So now I have 30 of these little things on my hand. They sure can come in handy but 30 is still way more than I will ever need (before the plastic hardens, deteriorates in the drawer and pollute the environment for no reason). So does anyone need a few of these? Given the cost economics in relation to the value of the item, I'm happy to share 20 of them but please don't make me mail with 1 in each envelope. Maybe in 4-5 or more unit lots? Let me know how many you need. Of course, 75c can get you 10 via Aliexpress with free postage... I still can't get my head around this! Spec: Approx 22mm in height fully released and 12mm wide. The oval opening is around 3x6mm, so will likely to be a bit tight for anything thicker than a pair of 2.5mm cord. Works fine for the narrow flat draw ribbon on my sleeping bag stuff sack. Hey guys, I haven't yet paid it forward from when I got some stuff from Moondog55 ages ago, so hopefully this can make up for some of it. All free but I will ask for postage costs if it's above $10. The reject shop frypan, bought as a set of three, never used the little one, not bad weight if you're into frying stuff on the trail. It's supposedly Carbon steel non-stick. Teflon coating. About 18cm diameter. Very low aluminium pot/pan thing. no idea where this came from just found it in the back of my wardrobe, must have had it for a long time, don't remember ever using it. probably useful as an ultralight frypan, or dry-baking dish with a larger pot. 53mm height. 145mm diameter. Gone Sol Escape Bivvy, used a few times, been stored for quite awhile, I haven't yet opened it to see how it looks, although it's been stored on a clean dry shelf so there shouldn't be any issue. No name brand utility knife, has knife, cork screw, Phillips head, nail file, can opener, another can opener with flat head screw driver, scissors, saw, and a thing I don't know what is. Case weighs 5 grams. Last edited by carryless on Wed 11 May, 2016 11:47 am, edited 2 times in total. carryless, is the SOL bivy still available? wicksey wrote: carryless, is the SOL bivy still available? Need to get rid of this pillow, neither myself or my partner manage to sleep a whole night on it but it's very comfortable for the first hour! For anyone who likes a firm pillow this could suit well. Weighs 102g. I have cleaned out my cupboards abd come up with a few items people may want. Due to work constraints i wont be able to get to the post office. So this is for Melburnians only sorry. Items will have to be collected from St kilda east. If youd like more detailed photos just pm me and ill do my best. Kathmandu eos sl day pack (30l i think) its a lightweight pack. The hipbelt has disappeared but otherwise in good condition. 2. GSI pot and frying pan lid about 1l. The pot grip has gone walkabouts and has been used but its in good nic. 3. Macpac silicone bowl and lid. 6. Gsi spoon never used. Still has stickers on it. 8. Silver foil car windscreen sunblocker for pot cozies. I can also supply you with tin foil tape if you need. 11. Windscreen, small case and parachord bracelet. 13. Im not sure if this last item is appropriate its more a car camping item but its free. Its a char broil grill to go bbq used 2 times. All these items are in working order. No locking rings tho; so if anybody is looking for a large stash container PM me for the pick-up address and I'll put one aside for you. Came with new camera, already got a charger, so if you cover the $9 standard Aus wide post, its all yours. It's always useful to have an extra charger or two, depending on how many batteries you have. I bought a hiking shirt during the aliexpress singles day sales, I should have known size large wasn't going to be true to size. More suited to a medium, I'll part with it for postage, or pickup in Melbourne. Khaki colour, quality seems decent. dinna89 wrote: I bought a hiking shirt during the aliexpress singles day sales, I should have known size large wasn't going to be true to size. More suited to a medium, I'll part with it for postage, or pickup in Melbourne. Khaki colour, quality seems decent. Might be worth having a look at Rivers big Fish shirts. LS buttons up and generous fit. Fast drying. Garmin Special - 4 pin Round PLUS Etrex flat -> USB - handy if you run both a Etrex and a 60CSX or similar. These came as specials from GPS OZ and may need drivers - worked on WIN7. I may be able to find the drivers somewhere. Also a Magellan Explorist XL GPS with adapter to stick on windscreen plus cable to power from Cigarette Lighter and USB Cable to computer (one for the nerds as I think you can get shape files onto these). Pickup from Coorparoo in Brisbane. I have two packs surplus to my needs. 1. GONE Is a Kathmandu Vardo, "L" in size which I would think is 70-75L. This pack was kindly given to me through Pay it forward a few years ago (apologies I can't remember your name mate, but thanks!!) I have upgraded as I planned so am happy to pass it on. It has a main sack as well as inside and outside pockets in the lid. 2. Is an older Jansport pack. 60ish litres at a guess. Not much good as a serious overnight pack but someone may have a use for it? Possibly a day pack or just for car camping, gear storage or venison hauling? It was a hand me down and has been sitting around for a while but hardly ever used. As with the Kathmandu, it has the main sack with a divider and both inside out outside pockets in the lid. Pick up can probably be arranged for Glen Iris, Albert Park or Dandenong. The Kathmandu could be worth posting? Last edited by Cauchs on Mon 27 Feb, 2017 8:06 pm, edited 1 time in total. Tastrax is the Explorist still available? GPSGuided wrote: One of my sleeping bag compression sack's plastic cord lock snapped and I went on to Aliexpress to buy 3 for extra redundancy (at US 75c 'each'). Didn't realise that the 'each' by their definition was a bag of 10. So now I have 30 of these little things on my hand. They sure can come in handy but 30 is still way more than I will ever need (before the plastic hardens, deteriorates in the drawer and pollute the environment for no reason). So does anyone need a few of these? Given the cost economics in relation to the value of the item, I'm happy to share 20 of them but please don't make me mail with 1 in each envelope. Maybe in 4-5 or more unit lots? Let me know how many you need. Of course, 75c can get you 10 via Aliexpress with free postage... I still can't get my head around this! Do you have any of these left GPS? Does anybody want a "Project" tent?? The big orange tent i bought for my brother is no longer needed and I don't want it. I don't have the energy to take on another project this large. Yes, would love them. Let me know postage costs and I'll transfer funds. PM me. Andrew, don't get me wrong, but its easier to just drop them in the bin outside the door. Given I'm doing the run around, how about you PM me with your address and I can get a price for postage. Been cleaning out my brothers house after the funeral. Lowe Alpine Goretex overpants, still servicable Large/Extra large. LW and still waterproof but starting to blister a little, pull-on type with zippers at the ankle. For those of you not familiar with the M-65 pants liners they have buttons down the side so they can be added while still wearing boots, it being much quicker to drop your pants than take off a pair of boots. I have a Primus Fuel Bottle (600ml version) if any one wants it. It has been used previously to carry a bit of extra unleaded fuel for my trail bike but I have since got a long range tank and fuel bladder it has sat unused for a while. I was keeping it in case I ever changed over from gas but I do not see that happening so hopefully someone else can use it. It weighs in at 115g.